Following the eight brief trailer previews Warner Bros. released yesterday, the studio has now unveiled the full trailer for Ocean's 8. This video offers more new footage than what was released in the first trailer that debuted back in December, and with this star-studded female lineup led by Sandra Bullock, we could be looking at one of this summer's biggest hits. Here's the official synopsis from Warner Bros.
"Criminal mastermind Debbie Ocean and seven other female thieves try to pull off the heist of the century at New York's annual Met Gala. Their target, a necklace that's worth more than $150 million. 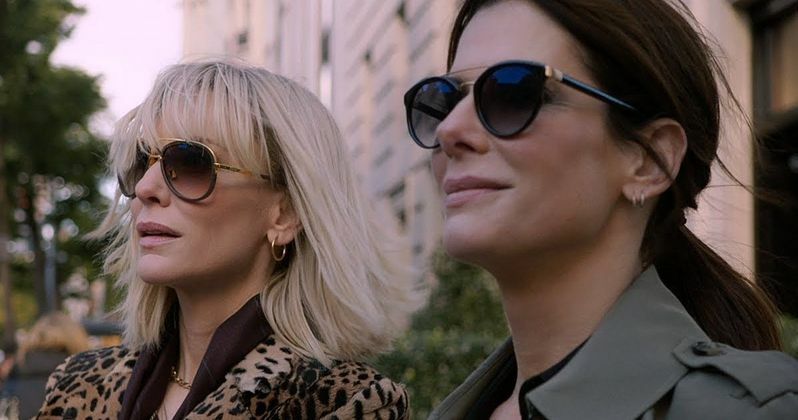 Debbie Ocean (Sandra Bullock) attempts to pull off the heist of the century with the perfect crew co-led by Lou (Cate Blanchett); and including Nine Ball (Rihanna); Amita (Mindy Kaling); Constance (Awkwafina); Rose (Helena Bonham Carter); Daphne Kluger (Anne Hathaway); and Tammy (Sarah Paulson)." Ocean's 8 could very well be a sleeper hit. That will all depend on how fans react to this trailer and subsequent footage, and it may also depend on a certain cameo appearance being removed. Shortly after the first trailer was released in December, an online petition was formed to persuade Warner Bros. and the filmmakers to remove Matt Damon from the film, who appears in a cameo as his character Linus Caldwell from 2001's Ocean's Eleven, 2004's Ocean's Twelve and 2007's Ocean's Thirteen. The petition was formed after the actor's controversial remarks about sexual harassment, and after reports surfaced that claimed the actor used his influence to stop a 2004 New York Times story that exposed Harvey Weinstein's history of sexual misconduct, which came to light last October in pieces from the New York Times and the New Yorker. The petition currently has 28,846 signatures, just shy of its 30,000 signature goal. Matt Damon controversy aside, this could have a big impact on the box office this summer. It is still set to debut June 8, with its only competition being A24's low-budget horror movie Hereditary. It was originally slated to open just one week after Deadpool 2, which was set to arrive on June 1 before it was ultimately pushed back a few weeks to May 18. This will give Ocean's 8 some much needed space, and now there will be just Paramount's Action Point and STX Entertainment's Adrift opening on June 1. Ocean's 8 will have to contend with The Incredibles 2 on June 15, along with Superfly and Tag, but its box office prospects have certainly improved, thanks to some release date shifting. The supporting cast is rounded out by Richard Armitage, Olivia Munn, Dakota Fanning, Jaime King, Katie Holmes, James Corden, Adriana Lima, Zayn Malik, Zac Posen, Anna Wintour, with Carl Reiner also reportedly returning as Saul Bloom from the Ocean's trilogy. Since Sandra Bullock's Debbie Ocean is the sister of George Clooney's Danny Ocean from the trilogy, there has long been rumors that Clooney will have a surprise cameo, but that has yet to be confirmed. Still, even if he doesn't have a cameo, if this movie is successful enough, it could lead to a sequel where these cinematic siblings could share the screen together. Gary Ross (Seabiscuit) directs Ocean's 8 from a script he co-wrote with Olivia Milch. While we likely won't get any concrete confirmation about a George Clooney cameo, the actor is serving as a producing, alongside Ocean's Eleven, Ocean's Twelve and Ocean's Thirteen director Steven Soderbergh and Susan Ekins. With just a few months left until the June 8 release, it's possible this could be the final trailer, although there is no word yet on how much more footage will be released between now and then. Take a look at the new Ocean's 8 trailer, courtesy of Warner Bros. YouTube.